Tenkeyless keyboards don’t incorporate the number pad, making them exceedingly compact. They’re increasingly gaining popularity among professional gamers for a number of reasons. For one, they’re portable, hence more convenient to carry to a tournament or LAN party. They also offer extra space to move around the mouse, especially for right-handed gamers. This article reviews some of the best tenkeyless gaming keyboards available. While this keyboard is a bit on the higher side when it comes to pricing, it provides sufficient value to justify that. 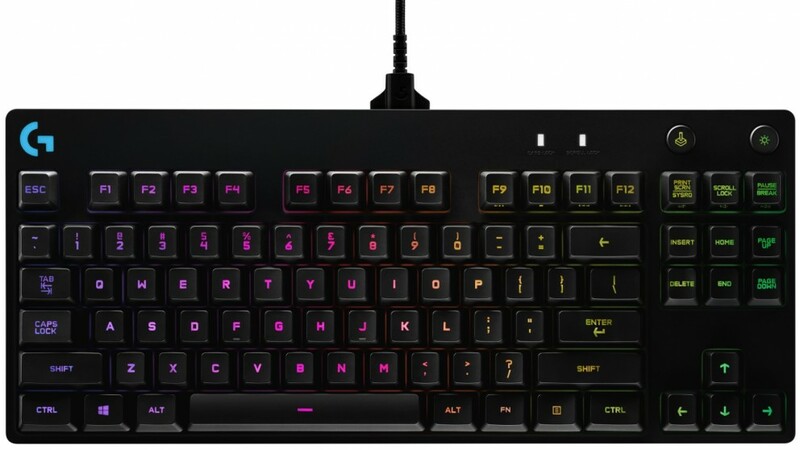 Some of its features include full RGB backlighting, low-latency responses and 1000Hz polling rate, Cherry MX switches, sturdy metal frame, and more. Corsair goes a little further to provide a few state-of-the-art features that are often only found in bigger full-size keyboards. It comes with dedicated media buttons for volume, lighting level, as well as Windows key lock. Moreover, it incorporates a comfortable removable wrist rest as well as a great USB pass-through port located on the back. In addition, the keyboard’s software, though awkwardly designed, is extremely powerful and flexible. The user is assured of massive control over key assignments and lighting as well as access to community-made profiles, which are easily downloadable. One drawback, however, is that Corsair employs Cherry MX Red switches — which are transparent — to enable the incorporated LED lights to penetrate. This keyboard uses Logitech’s proprietary Romer-G key switches. They’re characterized by high activation points and low activation forces. They don’t feature any clicky ‘bumps’. They’re more or less like the rare Cherry MX Speed Silver. The keyboard’s keys are held by the plastic keyboard deck, instead of floating above the metal deck as is the case with majority of the competition. While the keyboard is not flimsy — since the interior includes a metal frame — there’s a slight feeling of lagging. The aforementioned feature comes with the benefit of enabling the RBG backlighting to only penetrate through the keycaps, rather than glow throughout the edges, hence it can be seen as a tradeoff. Nevertheless, Logitech’s software is exceptional. It offers the user total control over backlighting, macros, and key mapping. Besides, it’s powerful, intuitive, and perfectly laid out. 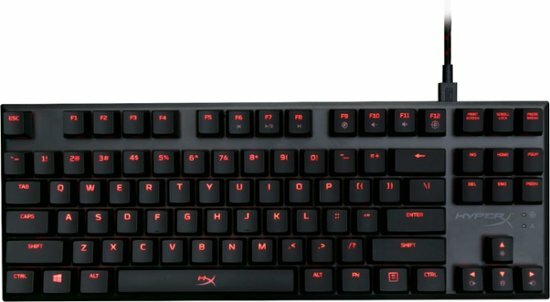 The HyperX Alloy FPS Pro is the best gaming keyboard to go for if one’s motive is to acquire a topnotch keyboard without the bells and whistles at a friendly price. It’s built with a strong solid metal deck, making it highly durable. It also incorporates Cherry MX switches, which are available in Blue, Brown, or Red. The board’s key action is both reliable and responsive with 1ms polling rate and n-key rollover. Its footprint is extremely small. Considering this plus the fact that its braided cord is removable, the HyperX Alloy FPS Pro is an superbly portable device. It’s the kind of peripheral that tournament players as well as LAN party devotees adore. Nevertheless, its reduced price means some features are not included. For instance, there’s no macro recording, advanced lighting customization, or specialized software. Also, backlighting is only available in red, and the user can only select from a limited number of lighting effects and brightness levels. Overall, it’s a modest, well-built gaming keyboard with a friendly price tag. Furthermore, it incorporates Cherry MX switches. Razer doesn’t employ Cherry MX switches in its keyboards as is the case with most of the competition. Similar to Logitech, the company designs its own proprietary custom switches. A good example is the Green Razer switch — which is included in this particular keyboard model — that bears some resemblance to the Cherry MX Blue in terms of feel and sound. This means its loud and tactile, hence attractive to users who prefer noisy keyboards, but unattractive to those who don’t. A good solution to the loud clicking would have been to use the company’s Orange switches. The keyboard is incredibly built and comes with a metallic keyboard deck with keys literally floating over it. Also included is the permanently attached braided USB cable. 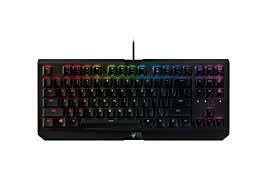 Razer’s Synapse software equips the keyboard with unmatched flexibility. 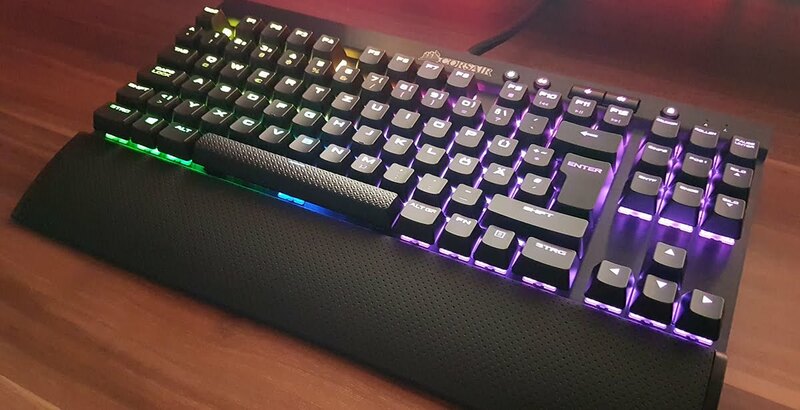 Given the benefits tenkeyless gaming keyboards promise user, it’s understandable why they’re increasingly becoming popular by the day. Be sure to check out more keyboard reviews before committing to making any purchases. It helps remarkable to understand any product before going ahead to buy it.